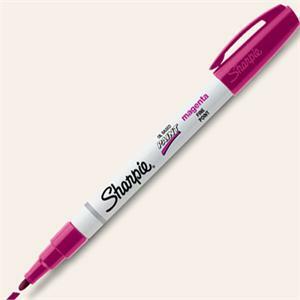 The marker of choice for autographs. Sharpie oil based paint markers are "AP certified to contain no materials in sufficient quantities to be toxic or injurious to humans, or to cause acute toxicity or chronic health problems". Why paint over ink? Paint pigment is fade, water, and abrasion resistant. Brilliant opaque colors even on dark surfaces. 13 brilliant colors and 4 tip styles make the Sharpie Paint markers the marker of choice for the art community. Adheres to nearly all surfaces including textiles, glassware, pottery, rubber, oily metals. Dries quick and won't wash off. TRY THE 13 COLOR ASSORTMENT FOR CONVENIENT ORDERING.